Just an hour's drive from the airport, the Taj Exotica is an inspired oasis of luxury and tranquility. The resort has 140 rooms and suites, set in a 56-acre complex landscaped with tropical plants, graceful palms and broad-avenue trees. Each room offers a view of the sea. Spacious and decorated in a style that oozes warmth and good living taste, the accommodation facilities offered at the Taj Exotica Hotel, Goa are excellent and offer the guests of the hotel with living standards that are ure to please the choosiest connoisseur. 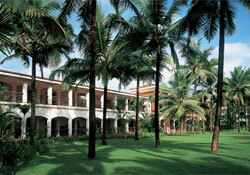 Almost all the 140 rooms, 2 presidential villas offer spectacular views of the azure blue waters of the Arabian Sea. * Eugenia Serving the best of Indian cuisine, this is a must visit during your stay here. * Lobster Shack If you have a taste for seafood and wine, then this is just the place for you. The presence of the 4,600 square feet ballroom is perhaps the perfect venue for all the banquets and gatherings possible. Added to this is the Palm Grove, a secluded part of the sea beach which is well equipped for mid to large sized groups.